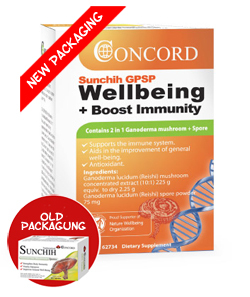 CONCORD SUNCHIH GPSP is formulated to support your immune system and promotes general wellbeing. It contains Ganoderma lucidum (Reishi) spore powder and mushroom extract. ALL CLAIMS ARE SOURCED FROM TRADITIONAL EVIDENCE. Ganoderma lucidum(Reishi) mushroom concentrated extract (10:1) 225 mg equiv. to dry 2.25 g and Ganoderma lucidum(Reishi) spore powder 75 mg.